Biofinity monthly silicone hydrogel contact lenses help you achieve a level of comfort you may have never thought possible. Traditional silicone lenses often provide high water content but a stiffer lens material or a softer lens material with low water content. With Biofinity, you'll get both! Made with Aquaform Comfort Science, Biofinity brings together essential elements like oxygen and water. High oxygen performance helps keep eyes white and healthy while the naturally wettable lens material holds water within the lens making it soft, moist, and resistant to dehydration and protein deposits without surface treatments or wetting agents. 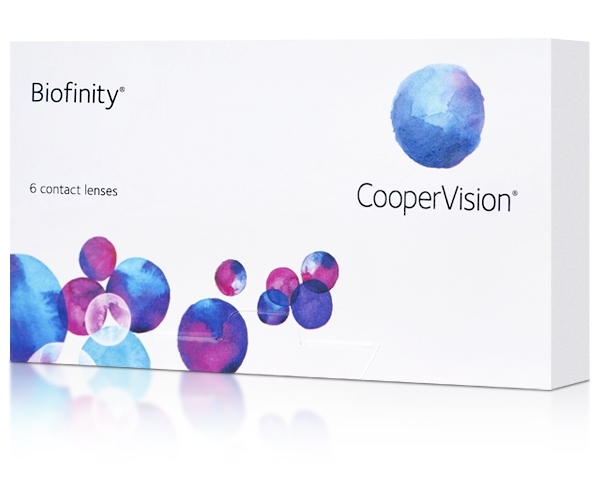 Additionally, Biofinity's aspheric front surface lens design provides enhanced vision. The lens focuses light better to a common local point giving greater image resolution and increased depth of focus for sharper vision. This unique combination of high oxygen, high water, and soft lens material creates a truly exceptional silicone hydrogel lens.